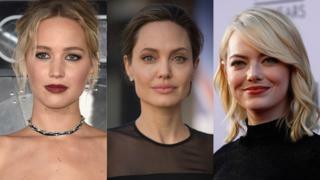 Hollywood stars including Jennifer Lawrence, Angelina Jolie, George Clooney and Emma Stone are set to head to this year's Toronto Film Festival. They'll be hoping to create an early buzz around their upcoming films going into awards season. Toronto is seen as a key launch pad for Oscar contenders. Previous films to win the festival's top award and then be nominated for the best picture Oscar include La La Land and Slumdog Millionaire. Stone will be returning to the festival to present Battle of the Sexes - in which she plays tennis star Billie Jean King opposite Steve Carell. Oscar winner Lawrence will offer up her latest film Mother!. Directed by Darren Aronofsky, the horror film also stars Javier Bardem, Domhnall Gleeson and Michelle Pfeiffer. Meanwhile Jolie and Clooney will both present films they've directed rather than starred in. Jolie brings her Cambodian genocide drama First They Killed My Father, with Clooney directing Matt Damon in Coen brothers' crime comedy Suburbicon. A strong British contingent will also be heading to the festival, including Lord of the Rings star Andy Serkis, whose directorial debut Breathe will receive its world premiere. The film features Andrew Garfield in the true story of disability rights activist Robin Cavendish. Other British stars expected to attend to support their films include Kate Winslet, Idris Elba, Benedict Cumberbatch, Jamie Bell and Gary Oldman. Many appear in historical dramas - Oldman appears as Winston Churchill in Darkest Hour, while Cumberbatch stars as Thomas Edison in The Current War. There are also a number of literary adaptations including Ian McEwan's The Children Act, starring Emma Thompson, and Disobedience, by Baileys Women's Prize winner Naomi Alderman, starring Rachel Weisz and Rachel McAdams. Other highly anticipated films to premiere at the festival include I, Tonya - which sees Margot Robbie star as disgraced US figure skater Tonya Harding - and Stronger, starring Jake Gyllenhall in the true story about a man who lost his legs in the Boston Marathon bombing. The full list of the first 14 galas and 33 special presentations announced can be found on the Toronto International Film Festival website.